Stephanie: Hello, Plum! Congrats on the B.R.A.G. Medallion and thank you for chatting with me today about your book, It All Started with a Bicycle. First off, tell me how you discovered indieBRAG? Plum: Well, I was trawling the internet, looking for organizations that review self-published books, and I came across indieBRAG. Their purpose seemed interesting, so I nominated my book to see what would happen. Stephanie: Please tell me about your story and state what genre it falls under. Plum: It All Started with a Bicycle is a middle-grade novel with an energetic, no-nonsense protagonist named Pam. At the start of her summer vacation after fifth grade she is unexpectedly inundated with all sorts of things which interfere with her own plans for the summer. These would have mainly been groaning through her never-ending chores at her parents’ seaside Bed-and-Breakfast, getting a summer job to pay for a new bike, and exploring Cape May and its environs all by herself. Instead, she is lured into a treasure hunt, spurred to hunt for her stolen bicycle (because she keeps seeing it around town), and is positively tortured by the ogre who runs the candy shop where she works part-time. Further “torture” comes at the hands of a bevy of “friends” who have been dropped onto her lap curtesy of her parents. These friends end up assisting her with all of the above, but not without causing chaos and confusion. Stephanie: What was your inspiration for the story and why did you decide to write a children’s book? Plum: I was working with fifth graders at the time, and after two years with ten-year-olds I was completely captivated with them and inspired by their crazy outlook. I believe the humor in this book stems from the fact that kids are inherently eccentric and that appeals to me. But as for the plot, one day the idea for the mystery itself just came to me out of the blue, and since I had lived in Cape May, N.J. for many years, the setting was natural—as was the opportunity for some unique features to the treasure hunt. I’m obsessed with architecture and Pam shares this interest. Architecture is central to the appeal of Cape May and is a fundamental component to this book. I also think that of all the children’s literature out there, middle-grade books hold the most interest for me. Stephanie: What are Pam Fischer’s weaknesses and strengths? Plum: Her strengths and weaknesses are probably the same thing: she’s energetic and rushes into action, but she’s often precipitate. She’s lively-minded, but she jumps to conclusions, often the wrong one. She has strong likes and dislikes which fact enables her to solve an interesting mystery, but strong feelings also taint her judgment. Stephanie: What is one of the sticky situations she gets into? Plum: The whole novel is one big sticky situation for Pam, who, at the outset, simply wanted to have a fun summer being left alone to do the things she loves, in addition to working toward a new bicycle. But things just don’t turn out the way she’d planned. Stephanie: What is the relationship like with her parents? Plum: Extremely good. There’s a lot of humor in their relationship, and these parents are very nice and easy-going. But they make it quite clear to Pam that she has to do things she doesn’t want to do, such as chores. And when she wants to quit her job because the manager is so mean to her, her parents make her stick it out. It is also made clear at the outset of the novel that her parents are not going to replace her recently stolen bicycle because it just doesn’t fit into their budget. It will have to wait, or Pam will have to earn the money. Stephanie: Where is the setting for your story? Plum: Cape May, New Jersey. It’s the southernmost tip of New Jersey and has been a place periodically beset by terrible hurricanes. A major part of the novel’s treasure hunt is looking for a house that was once originally built in South Cape May and later moved because of the storms that ravaged the area. Stephanie: What are the challenges and rewards for writing a children’s book? Plum: One of the challenges is surely the worry that I might be boring. Another is the imperative to write in such a way that the action and the dialogue ring true. I think kids can spot fake a mile away. Also, this particular genre is highly competitive. There are many, many great writers of middle grade books out there and an incredible number of middle grade books that are deservedly classics. Those facts constitute both a challenge and a reward. It’s challenging to face giants, but rewarding to try. Stephanie: What was your writing process for this story and how long did it take for you to write it? Plum: I hate to admit it, but I’d rather be faithful to the truth. I got the idea for this book in the spring of 2003, and finally uploaded it to Outskirts Press in the spring of 2009. So it took six years to write and revise. Of course, I was not writing continuously that whole time. I took long breaks from it due to one circumstance or another. But even after I had uploaded it, the book sat at Outskirts for another two years before I finally paid for its production. All of that is too, too long. Stephanie: Who designed your book cover? Plum: The book cover designer is Victor Guiza, someone I have never met or even corresponded with. Outskirts has an image bank of artists who produce original covers for people who choose to go that route and his work seemed most in keeping with the style I had in mind. After describing what I wanted, he produced a cover that blew me away. It’s just so beautiful! I absolutely love it. Stephanie: What is the message you would like your readers to come away with when reading your story? Plum: Well, first of all, I hope they have a few good laughs along the way because this book is funny and has extremely eccentric characters. But I hope that kids also come away with a comforting vision of an ideal family, even though having one is certainly not in their control—until they’re ready to have one of their own. I also want to reinforce the idea that helping out around the house is normal (as is complaining about it) and that you can’t always have everything you want immediately. Life just isn’t like that. Plum: Bicycle can be purchased as a paperback on Amazon and Barnes & Noble, not to mention at a lovely store in Cape May called The Whale’s Tale. As an eBook it is currently available on Amazon for Kindle, but very soon will be available for Nook, and at iTunes and Kobo. Stephanie: Thank you! It was a pleasure chatting with you! After an impecunious childhood spent moving around from one temporary residence to another, I made it through high school (barely) and into college. The most important factor that contributed to that unlikely outcome was being a reader. When I was a child my mother always read to me and I was encouraged to keep up the habit. I think that reading is the ultimate equalizer amongst people of radically different socioeconomic backgrounds, enabling a forward movement in life that transcends mere “upward mobility.” Because of exposure to books, the opportunities available to me have always been so much broader compared with other people who had social backgrounds similar to mine but in whose lives reading was not a value. Once at college (Arcadia) I received my B.A. in English, and then went on to Temple University, initially as a non-matriculated student (my undergraduate work was not impressive). I talked (begged) my way into being fully admitted into the graduate program, where I eventually received my M.A. My major area for the master’s was Romanticism. I continued on into the doctoral program and concentrated on Modernist poetry, at the same time taking more than my share of electives in the Philosophy department. As a doctoral student I published two book reviews in Nineteenth Century Contexts (1993 & 1995) and an article on the modernist poet Zukofsky in Sagetrieb (1995). I completed the coursework for the doctorate and was contemplating a diagnostic of post-structuralism for my dissertation, when I decided to drop out. I drove a Philadelphia cab for the next three years. Throughout this time, I read even more books than I ever had as a graduate student. From the classics to Renaissance Literature, from Art History to Political Science—I read widely. I also began to write fiction—a rather fair amount considering I’d never considered myself a fiction writer, but rather a literary critic. However, because of my lack of clear-sighted direction, it has taken a long time for me to turn “scribbling” into an actual goal, hence the lengthy time span from the inception of Bicycle to its publication. Once the novel was published in September of 2011, I made the rounds of awards, winning one from Reader Views. More recently, Bicycle received a starred review from Kirkus Reviews of which I am very proud. With the intent to speed things up a bit, I have recently published an eBook fantasy novella titled Worthy of Prometheus. 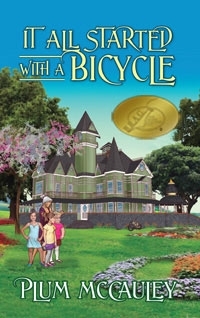 We are delighted that Stephanie has chosen to interview Plum McCauley, who is the author of, It All Started with A Bicycle, of our medallion honorees at indieBRAG . To be awarded a B.R.A.G. Medallion TM, a book must receive unanimous approval by a group of our readers. It is a daunting hurdle and it serves to reaffirm that a book such as, It All Started with A Bicycle, merits the investment of a reader’s time and money.